The third round of Varsity Football was explosive indeed, with the Wits student team winning their first match of the campaign. In their second away game, Wits beat UCT 1-0 at the Green Mile in Cape Town. Winger Neo Makua netted a last-minute goal, pulling Wits from the bottom of the log to a comfortable fifth position. This left UCT as stragglers on the log. Tshwane University of Technology (TUT) also won their game, scoring one goal against North West University (NWU) – Mafikeng Campus – on the losers’ home ground. Wits have scored the least goals in the campaign so far and have also conceded the most goals – eight in three games. NWU have been the highest scoring team in the tournament with 10 goals under their belt. Until last Monday they had never lost a match. NWU have now conceded two goals and lost one match. TUT has now taken top spot on the log and are now the only undefeated team in the competition. Their unbeaten streak makes them early favourites to take the tournament, but there are still six weeks to go. Strong defence play led to draws between Nelson Mandela Metropolitan University and University of Pretoria (Tuks) and between the University of the Western Cape (UWC) and the University of Free State . Wits will take on UWC today at 7pm on their home ground, Milpark Stadium. Wits Vuvuzela. 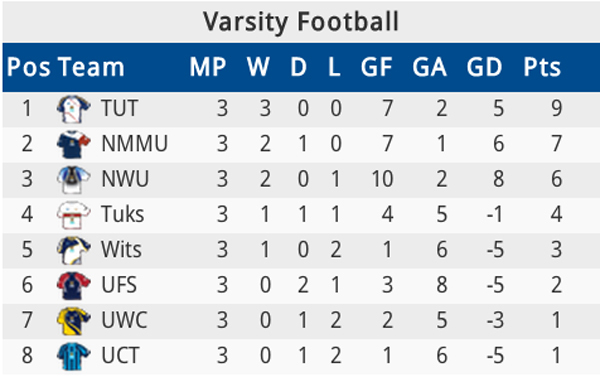 NWU hands Wits a drubbing at Varsity Football opener. 24 July, 2013.